Volvo’s performance brand has taken aim at the BMW M4 and Audi RS5 with the unveiling of the Polestar 1. The 600PS coupe will reach showrooms in 2019 and be the first of three Polestar-badged models to go on sale in the UK. 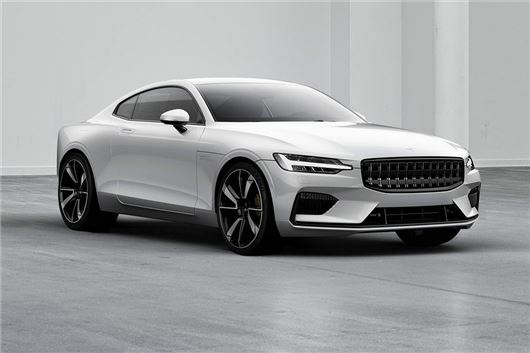 Volvo hasn't revealed any details on pricing of the Polestar 1, but has said that the Chinese-built hybrid will reach the UK in mid-2019 and be sold online on a two or three year subscription basis, with a zero deposit. Drivers will be able to collect the car from a dedicated Polestar dealer or arrange for it to be delivered direct to their home. Powered by a petrol hybrid powertrain, the Polestar 1 will be capable of covering 93 miles on electric-power, while the motor and 2.0-litre four cylinder engine will combine to produce 600PS and a staggering 1000NM of torque. The Polestar 1 will be built on the same platform as the V90 and feature a carbon fibre body that will increase torsional stiffness by 45 per cent to improve grip and high speed stability. The coupe will also uses a double electric rear axle, with torque vectoring to vary the level of power to each wheel mid-corner to improve grip. Advertised as a 2+2 coupe, the high performance hybrid will be capable of carrying two adults in comfort, while two small seats in the rear should be sufficient for children. The dashboard features the same iPad style interface as the V90, with touchscreen controls for all in-car settings, such as climate, navigation and media. There is no word on autonomous tech, but it would be safe to assume that the Polestar 1 will use the next generation of Volvo's semi-autonomous driving system that will assist with steering and speed on the motorway. Autonomous emergency braking should also be standard. Initially the Polestar models will be available in left hand drive only and the '1' will be followed by the imaginatively named Polestar 2 in late 2019. The '2' will be an all-electric hatchback that will rival the Tesla 3, while a larger SUV - called Polestar 3 - should follow in 2020.